6waves’ Sundae Smash is now available to play on Facebook. The level-based puzzle game sees players following a young girl named Eva on a journey through Planet Sundae, with her friends Collin and Douglas, in an effort to find a rocket ship that can send her home. Players complete levels by swapping the locations of ice cream sundaes to create matches of three or more like-symbols in a row. In each stage, players are asked to complete different kinds of goals without running out of moves. One level may ask players to collect a large number of particular colors of sundaes, for instance, while another may ask players to collect sprinkles left behind by a UFO. In these levels, players make matches next to the UFO to cause it to move across the game board, leaving sprinkled sundaes in its path. Players must then make matches with those sundaes in order to complete the stage. Another level type adds a popcorn maker to the screen. Similar to the UFO, players must make a match next to the popcorn machine in order to trigger the formation of popcorn on the screen for collection. However, instead of popcorn resting on top of existing sundaes (like the sprinkles), it replaces these symbols altogether for additional challenge. Still another level type sees players clearing cookies that rest under sundae symbols, by making matches with sundaes on top them. A door replaces the popcorn machine and UFO in these levels, and making matches next to the door triggers the formation of additional cookies on the board. Making a match of four matching symbols creates a power-up sundae, capable of clearing a complete row or column of treats from the board. Meanwhile, forming a match in a T or L shape creates a bomb, which can clear all sundaes in a small cluster from the screen. Swapping these two kinds of powers creates an even larger reaction, removing even more sundaes from the screen at once. Any cleared sundaes can count for the level’s particular completion requirements, where applicable. Finally, creating a match of five symbols in a row creates a power capable of clearing all sundaes of a single color from the screen. Again, users can swap these with other power-up pieces to create even more powerful reactions. Players earn up to three stars on each level, depending on their total number of points. These stars reward players with coins, which are spent on additional power-ups before a stage. These include extra move bundles, and the ability to start the game with a bomb symbol on the board, as examples. Other powers are available to purchase during a game, but these cost premium currency. One is an ice cream scoop, used to clear a chosen symbol from the board, while another is a bomb, which clears nine symbols in a chosen square instantly. A lives system limits the length of a single gameplay session, as players lose lives if they fail to complete a stage before running out of moves. These recharge automatically over time. For social play, gamers can compare their scores with their friends’ on the game’s level-specific leaderboards. Users are encouraged to invite their friends to play the game as well, and will receive power-ups when their friends accept and join. In addition, players can ask for lives from their friends when they need more. 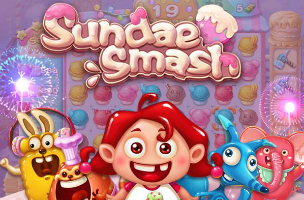 Sundae Smash is available to play for free on Facebook.